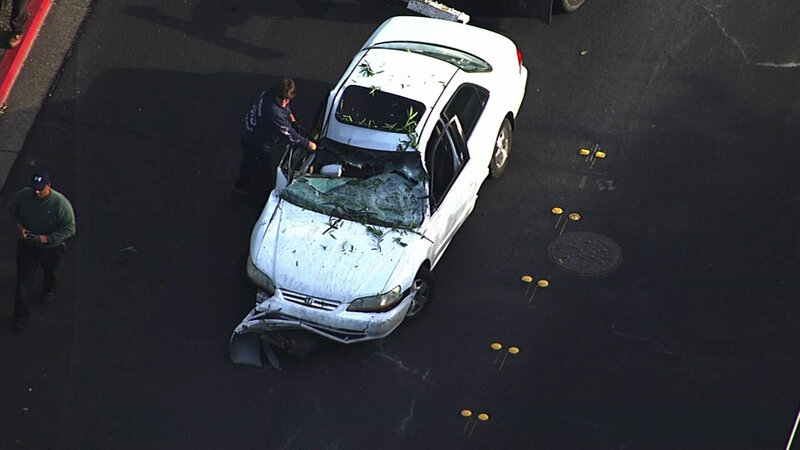 WALNUT CREEK, Calif. -- Police were involved in a minute-long vehicle pursuit with a residential burglary suspect this morning in Walnut Creek that led to a crash along a BART trackway, a police lieutenant said. The incident began shortly before 7:30 a.m. when officers were dispatched to a report that a home was broken into on Walnut Boulevard, Walnut Creek police Lt. Lanny Edwards said. Arriving at the scene, officers found a suspect who immediately got into a vehicle and began to drive away, Edwards said. A vehicle pursuit ensued but ended only a minute later when the suspect crashed his car into a fence next to BART tracks at Walden and Jones roads, Edwards said. The suspect fled on foot after the crash, hopping fences and trying to evade officers through the backyards of several homes, Edwards said. Pursuing officers apprehended him at 7:37 a.m., not far from where the crash occurred, Edwards said. Edwards was not immediately able to release the name of the suspect, but said he was a parolee. His crashed vehicle pushed the fence within about three feet of the BART tracks between the Pleasant Hill and Walnut Creek stations, causing major delays on the Pittsburg-Bay Point line, BART spokesman Jim Allison said. Allison said trains had to single-track through the area while crews removed the vehicle. He said the car was removed and service began again in both directions as of about 8:40 a.m.
Certain eastbound trains on the Pittsburg-Bay Point line that only run during commute hours had to turn around at the Lafayette station as a result of the incident, he said.